Hi! 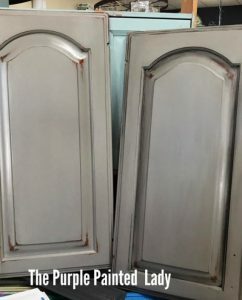 If you have have refinished your cabinets using Chalk Paint® by Annie Sloan and her wax ….. I bet they look awesome! Congratulations! I want to help you keep them looking great! NIGHTMARE: First- let’s address the worse situation. Meaning, something VERY BAD happens- (queue the scary music in a horror film now) ……like a black sharpie was taken to the front and there is a “permanent” mark….or Crayola Crayons were used, or the black from the rubber bumper around a vacuum left a scuff …or a scuff from a kids shoe…..or for that matter……anything that does not come off with a gentle cleaner/dish soap and warm water. Take a soft towel and get a small amount. Like less than a single green pea. Lightly rub that on the abused area until you see the stain lift off. You might need to re-wax the whole door to get a uniform look- but this should have done the trick. The reason this works is – there is a component in the wax that keeps it soft and spreadable. This component will also soften the top micro layer of existing wax on your cabinet door (or dresser, or table, etc) When it softens that layer- it also allows you to lift any serious dirt or stain. If your cabinets were painted a while ago- you do not realize this…but dirt and dust will land on them. By cleaning only one spot….it may acknowledge that the rest of the door needs to be cleaned also. So, a nice once over with the clear wax will do the trick. NOTE- if you have applied a tinted wax all over your cabinets- such as Annie’s Dark, Black or White wax. You will probably need to use Clear Wax over the entire door, and then re-apply the tinted wax. Another option is using Odorless Mineral Spirits on a rag- to wipe off all of the surface wax, in hopes- it also removes the problem area. Using a little odorless mineral spirits on it and wipe off some of that wax build up. Your rag should be damp only, not dripping! I like to use “real” Mineral Spirits..meaning not the environmentally “green” Mineral Spirits that has a milky white appearance. I feel it does not work or perform nearly as well as the original Mineral Spirits. Take your rag and place it on the opening of the Mineral Spirits container. Flip the container a couple of times in different areas of the rag. (the image I want you to think of is how a person would put nailpolish remover onto a cotton swab or ball!) With a tiny bit of Mineral Spirits on your rag, rub the area you are trying to remove the wax. The mineral spirits on the rag will remove some of the wax. You do not want to be aggressively scrubbing in any one spot- you want to have uniformed removal of the build up. If the stain or problem area disappears- then – take a rad lightly moisten with water, Wipe the cabinet down again. Let it completely dry. Finish with a fresh coat of wax over the entire surface. Lastly- Annie Sloan’s products are amazing- but they are not a miracle. If for some reason- you can’t remove the “nightmare” of a stain – you may have to repaint and then wax. This is why I always tell people, to keep some of their leftover paint and a tin of Clear Wax in the back corner under their kitchen sink. And know this- a touch up probably will not work. You may need to repaint the entire door. From regular dusting to cleaning splatters and spills, you can help maintain the beauty of your cabinets by following these recommendations. Do not aggressively scrub in any one spot. Harsh detergents, strong soaps, abrasive cleaning products such as tub and sink cleansers, scouring powder, scouring pads, steel wool or self polishing waxes. Sponges or dish cloths. They may contain particles that could scratch your cabinets, or they may contain food and oil residue or remnants of harsh cleaning solutions. Over time, polishing compounds may build up on the surface of your cabinets and cause a hazy, streaky or yellowed appearance. Never use Endust or Pledge on cabinets. DO YOU PAINT CABINETS FOR OTHER PEOPLE? 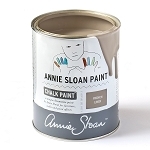 I recommend that you add or embed to your painting quote ….the cost of one new tin of clear wax by Annie Sloan. Leave it with the customer under their kitchen sink. Explain to them and leave a document on how to use it. Provide them with TWO copies of a documented “CARE TAG” regarding on the proper way to clean their cabinets and have them sign off on your job – acknowledging that you left it. If you do not have a care tag…MAKE ONE NOW! Just copy and paste what is above and tweak it to fit your style! If you transform a project and would like to share it with The Purple Painted Lady® via your Facebook or Instagram page, please use our hashtag!!! #thepurplepaintedlady We love seeing what you are all working on! This information is directed to those who do NOT have a local stockist. Because if you do – go and meet them, shop from them and build a relationship with them. The guidance, information and knowledge they share with you – will be invaluable. Get inspired by their shop that they lovingly curated – just for you! Enjoy that one on one experience! 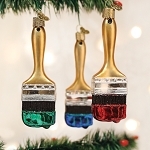 But for those who are in a location where there is no one selling paint products- and you must buy on-line- consider us. With that said, visit www.anniesloan.com to find a stockist near you.